It’s important to push yourself. The best motivation originates from within. 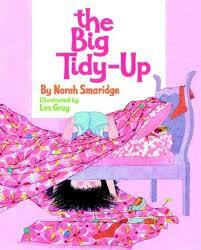 One of my favorite childhood books was The Big Tidy Up and if you’ve read this sweet story you know, Jennifer doesn’t clean her room until she is disturbed by the mess. Tolerance for situations varies from one individual to another. The ability to withstand a circumstance depends upon an awareness of how long it will last. We learn to pace ourselves. We count mile markers on road trips. We watch the flight path on the headrest of the seat in front of us, calculating the arrival time. We watched Brian Norcross with his pocket calculator figure the time left until Hurricane Andrew would pass. A marathon runner paces their speed and fuel in the same way a Nascar pit boss paces his driver. I paced myself. I’ve technically crossed the finish line. The house is complete; we’re in the home stretch and official moving day is this Saturday. This is the cool down when you realize how long you’ve been running and the true depth of your fatigue. Nothing supplants fatigue faster than joy and happiness. I am tired into my bones, in my sinews. But I am also lighthearted and gleeful, and the knots in my stomach have transformed into fluttering butterflies. Nervous and eager and full of anticipation, I can barely stand it. Giddy. There is a profound difference between the anticipation of dread and that of WANT. When so often and for so long, the goals felt unobtainable and rife with obstacles and last minute curve balls and sucker punches, Friday afternoon was tortuous. I feared that it would all collapse….I was terrified…it was a conditioned response, not pessimism. But it all worked out. It all came to fruition. I celebrated with my builder, sister and best friend. 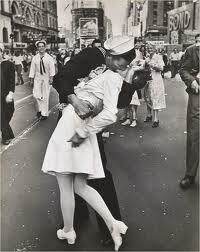 And then the next day, I felt like I had gotten a great kiss….I felt like a nurse being kissed by a sailor on shore leave. Priceless.